The Southport-Oak Island Area Chamber of Commerce is a voluntary organization of businesses and professional men and women who work together for the purpose of encouraging growth as well as the economic progress of our community including Bald Head Island, Bolivia, Boiling Spring Lakes, Caswell Beach, Oak Island, St. James, Southport, Sunset Harbor, and Supply of Brunswick County, NC. IT'S YOUR SPOKESMAN ... your voice on governmental and community issues ... the central organization in which you and your fellow businessmen join hands to support measures and projects that benefit you, your family, your business, and your community. IT'S YOUR ADVOCATE ... improves community understanding of the free enterprise system ... face to face, frank exchanges of views between local business people and their political representatives. IT'S YOUR TRAINING CENTER ... sponsors seminars and workshops on subjects of concern and interest to business through the Brunswick Community College Small Business Center ... provides small business management assistance through the Small Business Center at BCC, SBTDC at UNC-Wilmington and SCORE. IT'S YOUR INFORMATION BUREAU ... facts on business trends and population ... keeps you posted on new developments affecting your business. IT'S YOUR GOODWILL AMBASSADOR ... it tells the nation about commercial and recreational facilities ... helps local businesses obtain maximum benefit from tourism. IT MULTIPLIES YOUR EFFECTIVENESS IN THE COMMUNITY ... by providing the structure, volunteer leadership, professional staff and full-time office operation to implement an effective program to meet the needs of a growing community. The mission statement of the Southport-Oak Island Area Chamber of Commerce is to advance the general welfare of its members and the prosperity of the area so that all citizens and all areas of its business community shall prosper. Particular attention and emphasis shall be given to the economic, civic, commercial, cultural, industrial and educational interest of the area with all appropriate means of promotion provided. What Benefits are Included in Your Investment? Chamber E-News. Informational email newsletter focusing on upcoming Chamber events, advertising opportunities, fraud alerts, legislative issues and other time sensitive news. Serve on one of the many Chamber Committees and make a difference. Volunteer for a special event and network with other volunteers. Attend Chamber's Annual Meeting and see what your Chamber has accomplished and what it has planned for the next year. Member to Member E-News. Email newsletter sent to members on the 15th of each month. Members shamelessly promote new products, personnel or services. Directory listing in the printed & online Wedding & Meeting Planner Vendor Listings. Directory listing in 45,000 copies of the Picture Perfect Guide for Living & Recreating Guide. Directory listing in the online Business Directory including a website link. Distribute your brochure and/or business card in the Chamber’s Welcome Center. Receive database of other members. Use “Member of the Southport-Oak Island Area Chamber of Commerce’. Customers place value if your business belongs to the Chamber. Schedule a Ribbon Cutting Ceremony for the opening of a new business or to celebrate a milestone anniversary. Get nominated for a Golden Pineapple Award. Compete and win the Small Business Person of the Year and/or a Small Business Customer Service of the Year. Use the Executive Conference Room -seats 6. Opt into a workers compensation insurance program First Benefits Insurance Mutual without the added expense of belonging to the NC Retail Merchant's Association. Chamber members receive a discount up to 25% on Constant Contact services. ADVERTISING DISCOUNT FOR NEW MEMBERS: Effective with the 2016/2017 fiscal year, all new Southport-Oak Island Chamber of Commerce members are eligible for 4 consecutive weeks of advertising for a discounted rate of $7.50 per column inch (our normal rate is $8.50 per column inch) with a minimum 10 inch ad in The State Port Pilot. After the 4 weeks, members who wish to continue advertising may extend the contract for an additional 9 consecutive weeks at a rate of $6.75 pci with only a 2” minimum. This offer is good to members for a period of 60 days from the date they join the Chamber. Established members are encouraged to contact their State Port Pilot sales representative to discuss which discounted rates are available to them. Access to resource materials published by the Chamber. Discount Rate for the TalkShop App - business text messaging platform. Attend seminars like the NC DOT Update, Economic Climate Update. The annual investment can’t cover all the expenses so there are additional benefits for those members who choose to participate. These benefits are either limited to only Chamber members or members receive a substantial discount. Diamond Membership Level - Enhance your business listing on the Chamber’s Website and Mobile Application. Detail View, Post Deals, Active E-mail, Fax number, Badges, Detail Description, Video, Additional Uploads, Hours of Operation, Location Reference, and Facebook Social Plugin. $100 annually. Advertise in the 45,000 copies of the Picture Perfect Guide for Living & Recreating Guide & get a highlighted directory listing with bonus lines to describe your business, directory listing on the Brunswick County map & included in the page turning guide online. Advertise in 10,000 copies of the Brunswick County map. Purchase a display booth at the Christmas Gift Show. Purchase a display booth at a discounted rate for the Coastal Consumer Showcase. Enter the Christmas by the Sea Parade at a discounted rate. Sponsor information first on Chamber events: U.S. Open King Mackerel Tournament, Oak Island Lighthouse Run/Walk, Southport-Oak Island Golf Classic, Coastal Consumer Showcase, Christmas by the Sea Parade. Kept informed on opportunities with the N.C. 4th of July Festival, which is a separate organization but the Chamber provides administrative support. Subscribe to leads list. Contact information emailed to you from those who requested information. Monthly email sent to leads with your information included. $50 Annual subscription. Purchase Workers Compensation Insurance at a group discount through First Benefits Insurance Mutual, Inc. (FBIM). As part of its organizational structure, FBIM policyholders and agents are required to be a member of one of these organizations: NC Retail Merchants Association, Carolinas Food Industry Council, Mutual Drug, NC Tire Dealers Association or Turf Grass Council of NC. 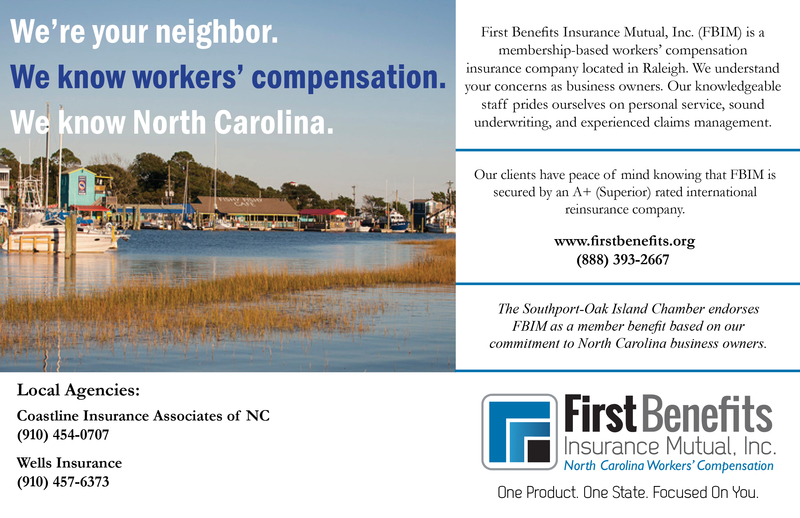 However, FBIM is an endorsed member service for the Southport-Oak Island Area Chamber of Commerce and as such current members of our Chamber will fulfill the membership requirement for policyholders, saving you the cost of joining these other organizations. Click to find a local agent to get a quote. Participate in co-op advertising & marketing promotions like Shop Small Saturday Weekend. Rent the Chamber’s Main Conference Room. Seats 40. As a Chamber Member, you’ll enjoy exclusive savings on Constant Contact’s entire suite of marketing tools, with plans starting as low as $20.00 per month. Get a FREE 60-day trail and when you’re ready to buy save 20% when you prepay for 6 months or 25% when you prepay for 12 months. Details. Questions? Contact the Chamber at 910.457-6964, or email Charlie Blalock at blalockcharlie@gmail.com, Membership and Publication Sales Agent if you wish to take advantage of membership privileges or become active on a committee.